2nd January 2018, New Delhi: Earlier this year, after polls were conducted by LocalCircles in which over 42% consumers had reported products being listed for a higher price on ecommerce sites than the Maximum Retail Price (MRP), the Department of Consumer Affairs amended the Packaged Commodity Rules 2011 and issued a notification on 23rd June 2017, where from 1st Jan 2018, sellers on all eCommerce sites will have to disclose the actual MRP of the product. Though the Department of Consumer Affairs gave six months for the ecommerce sites to comply, most of them still aren't ready with MRP disclosure on 100% of the products. 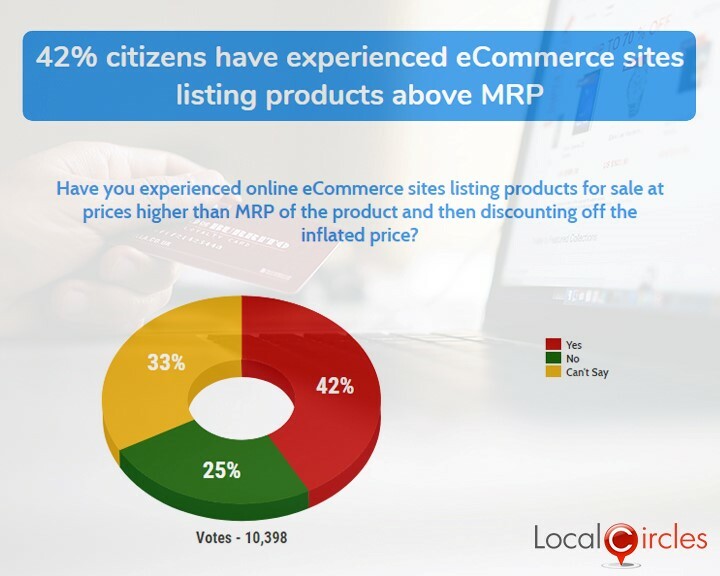 Feedback from users on LocalCircles is suggesting that only 10-12% of the products on an eCommerce site are now showing MRP as they are being stocked by the eCommerce sites themselves. Most sellers on the eCommerce sites have failed to comply and still not uploaded the MRP on the eCommerce sites. Soon, eCommerce companies will have to take a call to speed up enforcement and demand that the product cannot be listed or sold unless it has MRP. Every genuine packaged product has MRP and the sellers here have multiple options ranging from uploading a picture of the MRP tag on the product or simply making the details available in the Price section. In addition to the MRP disclosure, consumers had also demanded via the Connected Consumer circle operated by the Department of Consumer Affairs that all human consumption products (food, medicines, cosmetics, contact lenses, etc) listed on eCommerce sites must also display best before or expiry date so the consumer can make an informed decision. This consumer ask was also accepted by the department and through the Packaged Commodity Rule amendment 2017, it is mandatory from Jan 1, 2018 for eCommerce sites to disclose the best before date on all human consumption items. This requirement means that the same food product may now be listed twice based on the manufacturing lot number. While eCommerce sites are outlining compliance difficulties for this new requirement, it does help the consumer. Many consumers earlier had reported receiving products from eCommerce sites which has 30-60 days of shelf life remaining and their inability to consumer them thereby feeling cheated. The return policy on food items is also quite stringent with most eCommerce sites. So, if the Department of Consumer Affairs focuses on enforcing these in a collaborative way with the eCommerce sellers, chances are it will be a win-win for the consumer as well as the businesses as consumer trust in eCommerce as a channel will surely increase. However, the Department must ensure the new rules do not give way to inspector raj as it will be the food and legal metrology inspectors from the state consumer and food department knocking on the eCommerce warehouse to check compliance. All content in this report is a copyright of LocalCircles. Any reproduction or redistribution of the graphics or the data therein requires the LocalCircles logo to be carried along with it. In case any violation is observed LocalCircles reserves the right to take legal action.